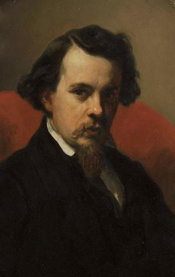 With the current re-assessment of the Dutch Romantic Landscape School, Charles Leickert is emerging as a much more important figure than he was rated by Marius at the turn of the century. The fact that he lived to almost ninety explains his prolific oeuvre and the variations in style and quality among his pictures. He can be a traditional landscapist in the manner of his master Shelfhout … or he can paint sparkling effects of light with quick impressionistic brush strokes-an altogether more modern manner. At his best he is something of a Dutch version of Constable, a high point in a century exceptionally well supplied with landscape artists. Charles Henri Joseph Leickert was born on 22 September 1816 in Brussels, Kingdom of the Netherlands (became Kingdom of Belgium in 1830). His parents were born in Germany where they lived during the first years of their marriage, then relocated to Brussels in 1815. After the French occupation of the Netherlands ended, Leickert’s father took the position of “Chamberlain” in the court of King Willem I. Several years later, the family settled in The Hague, after it was designated the official capital of the Netherlands. However, the years that followed were not that happy for Charles, as he lost four of his siblings to sickness, and was orphaned when he was only fourteen years old. After leaving the orphanage in 1840, Leickert continued to reside in The Hague and began to establish his artistic career. By 1841, he had produced and exhibited his first winter scene, which received a positive review from an anonymous art critic who said: “Mr. C. Leyckert, of The Hague, demonstrates with a winter scene with some buildings that he has turned the lessons of his master to good use.” (Kraaij, pg. 31) He also began painting summer landscape, a genre, which he loved, as well as more water views, which later became a permanent element in his compositions. In 1848 Leickert moved to Amsterdam where he resided until 1887. He wanted to establish himself as an independent painter and knew that Amsterdam offered more opportunities for artists to exhibit and sell their work. He became a member of the artist’s society Arti et Amicitiae, and soon got involved in the artistic life there, after reuniting with a number of his artist friends. One of them was Rochussen, who lived in the same house as Leickert for some time. Once more, they collaborated on a number of works, such as Beach near Scheviningen (1848) and Cityscape in Winter (1849), the first of this genre that Leickert exhibited. In 1856, Leickert joined the Board of Governors of the Royal Academy of Fine Art in Amsterdam. In the 1860s Leickert was asked to participate in the project for the Arti Society’s Historical Gallery. In order to enhance the status of history paintings in Holland, young artists were asked to portray the nation’s past “envisioning of Holland’s renown in the fields of history, science, art trade and craft.” (Kraaij, p. 53) In 1862, Leickert’s painting was among the first group of the fifty-two works to be completed and inaugurated by the King on 29 March 1862. This painting entitled Amsterdam, the Greatest Trading Centre of Holland portrayed a view of the medieval town with several figures dressed in the costume of the period (title was initially given by an exhibition reviewer; in 1895 this same painting was exhibited under the title The Town Hall of Amsterdam in the Mid-Fifteenth Century). In 1887, Leickert decided to end his artistic career, and moved to Mainz in Germany with his wife. While he remained a member of the Arti society, he submitted only one painting entitled Landscape in Taunus in the exhibition of 1893. Among the few works that he produced during the last twenty years of his life were Winter Landscape with Frozen Canal and Skaters (1891) and Summer Scene in a Dutch City (1892). Leickert died on December 5, 1907. Leickert was a prolific artist producing approximately seven hundred paintings, of which he exhibited about eight-five.